Part four of the modern twist on classic fairy tales has a troublesome beginning. Our hero Shrek is suffering from suburban ennui, the kind of disenchantment with domestic life that you might find on the TV show Desperate Housewives. What happened to the charming ogre we know and love? After that disastrous start, the movie recovers and gets back to what we love about Shrek. Additional characters like the villainous Rumpelstiltskin and the Pied Piper, who plays “Shake Your Groove Thing”, are enjoyable additions. A big improvement over the last installment, but the main character isn’t quite as captivating as he was in the original film. Perhaps it’s telling that all of the funniest lines come from Puss in Boots. Given that, a fitting end to this series, and perhaps an opportunity to start a new one. This entry was posted on June 1, 2010 at 1:14 pm and is filed under Adventure, Animation, Comedy, Family, Fantasy with tags 2010. You can follow any responses to this entry through the RSS 2.0 feed. You can leave a response, or trackback from your own site. I hate Shrek with a passion. I just can’t explain it. This was much better than I expected. Nice surprise. I will always get a kick out of Puss n Boots’ big sad eyes. It gets me every time. lol..so you saw it? I think it should have ended and this one was completely unnecessary. Now you’re forcing me to look up the word “ennui” – that’s a new one for me. But yah, the premise of this movie which sets off all the action is not appropriate for children. No wonder all the young people are me, me, me and no longer believe in the possibility of a long, successful marriage. Sorry, I’m still old school and believe in “death til we part.” Shrek just needed a vacation in my opinion, lol, no need to have stuck a deal with the devil. Ah…now that’s one cliche that’s overdone? I disagree completely. 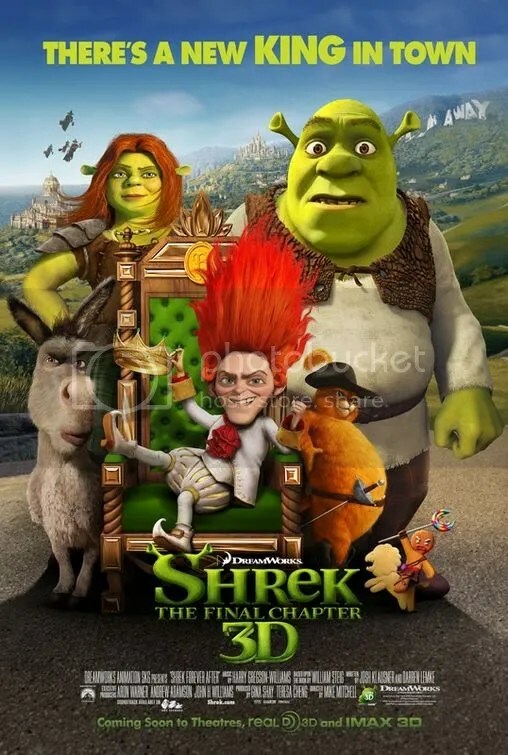 I think that this was a great end to the Shrek series & I could not of asked for a better ending.